Supracon is a leading high tech company in the sector of superconducting electronics and has specialized in the development, fabrication, and marketing of ultra-sensitive superconductive sensors, read-out electronics and measuring systems. Our primary products – both Low Temperature (LTc) - and High Temperature (HTc) SQUIDs (Superconducting Quantum Interference Devices) – are based on an unique microfabrication technology. 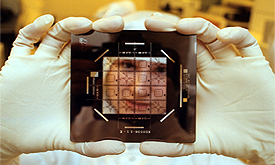 Supracon was founded on January 1st, 2001 as a spin-off from the Department of Cryoelectronics at the Institute for Physical High Technology Jena (now Leibniz-Institute of Photonic Technology) and has grown into one of the prime suppliers of SQUID based components and systems in the world. Supracon continues the fine tradition of superconductor electronics, which had been established more than 30 years ago in Jena. It is our vision to improve today’s technology and to establish the superconducting technologies in industrial applications.